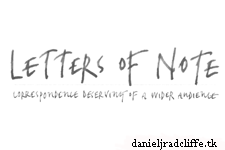 Daniel's Google+ page was updated again yesterday with a message in which he talks about a book he received for Christmas which is Letters of Note ("correspondence deserving of a wider audience") a compilation of letters, postcards, memos, etc.) and, like you can read below, he will share a link from the Letters of Note website every Friday. So below you find the first one. "Hi everyone on Google Plus! I want to share with you a brilliant book I received for Christmas. It's called LETTERS OF NOTE and is a compilation of letters, postcards, memos, etc. I'll provide a link each Friday to one of my favourites, but you can dig in now and read all you want online!" me encanta leer y que mejor que textos recomendados por ti o ustedes. espero y esta pagina siga en accion por mucho mas. It's a very good idea! I've read the letter that Dan suggest, and I think it's very particular: a funny "play with words", and it's logical that an actor like a play such this. Writers and actors works and play with words and emotions, so I understand Dan, because I like very much to write!